Imani Dupree, a junior at Sheldon High in Sacramento, made the most of her trip to Idaho over the weekend by winning both the 60- and 200-meter dashes at the Nike Boise Indoor meet. Dupree was one of five CA girls to win individual events during the two-day meet held at the Ford Arena in Nampa, Idaho. She popped a 7.60 PR for the fastest 60-meter time in the prelims and followed that with a 7.62 burst to win the final by .08 ahead of runner-up Maya Hopwood of Central Oregon Track. Alysah Hickey, an Oregon-bound senior from Coronado (SD), won the long jump in 19-03.75. Hickey, the returning State Meet champion in the event, popped the nation's ninth-longest jump indoors this winter. Charlotte Tomkinson, a junior from Menlo (CC), won the 800 in 2:13.84. Tomkinson was sixth in the 800 at the State Meet, running 2:10.58, and is the No. 3 returner from that race. Cate Joaquin, a freshman from St. Francis Sacramento (SJ), won the two-mile run in 11:58.35. Meagan Kiefer, a senior at Branham (CC), won the 60m hurdles in 9.00. Athletes compete unattached or for club teams to comply with CIF rules. Their high school affiliations are included in this report for identification purposes. Hickey competed for Step UR Game Up, Tomkinson for Menlo iGreyhounds, and Joaquin for Sacramento Elite TC. Dupree and Kiefer competed unattached, per meet page results. 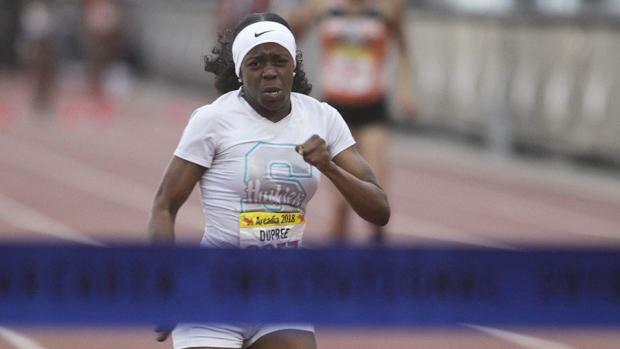 In the 200, Dupree's 24.96 winning time was also a personal best. Bonet Henderson (Xtreme Speed Club) was second in 25.10 and Hopwood was third in 25.49. Dupree was the best of nearly 90 participants in the 60 and more than 100 runner in the 200. Hickey, who is also a sprinter and State medalist high jumper, competed in three events in Boise. Aside from the long jump, she competed in the 60 meters, running 7.76 in the prelims and 7.87 for fifth in the final. And, she anchored the winning 4x200 relay team for Step UR Game Up. The winning time for the team of Ava Taylor, Erica Chiang, Madeline DeBorde and Hickey was 1:44.05. Tomkinson's closest competition in the 800 was her classmate at Menlo, Kyra Pretre (2:17.52) with Abigail Krzemien of the Idaho Dash Track Club placing third in 2:24.67 in the event that drew more than 50 competitors. Three other CA girls rounded out the top six in the 800 with St. Francis Sacramento (SJ) junior Emma Hollenbach placing fourth (2:26.76), Half Moon Bay (CC) junior Kendall Mansukhani crossing in fifth (2:28.46), and St. Francis Sacramento (SJ) freshman Cate Joaquin finishing sixth (2:28.66). Tomkinson also anchored the winning 4x800 team for Menlo iGreyhounds Track. The winning time for the team of Mansukhani, Pretre, Claire Yerby and Tomkinson was 9:23.94. In the two-mile, Joaquin crossed almost four seconds ahead of runner-up Sarah Perry, a junior at Woodside (CC), who finished in 12:02.01. In the hurdles, Kiefer had the fastest time in prelims (9.05) and went even faster in the final to beat out Pocatello Track Club's Madi Zink by 0.15.